Foremost among Yale University’s many assets are its superb library resources. Yale’s formidable collections of books, scores, manuscripts, archival papers, and sound recordings provide an ideal support for individual research, attracting students and scholars from around the world. 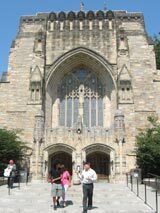 The principal site for the study of music is the Irving S. Gilmore Music Library, an architectural gem located within the Sterling Memorial Library, itself one of the landmarks of the Yale Campus and the repository of around 4 million volumes. In addition to housing substantial collections of books and monographs on music, music periodicals, and sound recordings, the Music Library is also the home of notable archival materials, among them large collections of Charles Ives, Virgil Thomson, Carl Ruggles, Kurt Weill and Lotte Lenya, Cole Porter, Benny Goodman, and others. Inside the Music Library one also finds the Yale Collection of Historical Sound Recordings, a vast and fascinating treasury of recorded sound from the 1890s onward, one of the richest such collections in the world. While the archival papers held by the Music Library are considerable, the principal archival center on campus is the nearby, magisterial Beinecke Rare Book and Manuscript Library. Ranging widely over many fields, cultures, and historical periods, the Beinecke’s holdings are breathtaking. In the area of music these include: numerous medieval and early modern manuscripts, such as the celebrat Mellon Chansonnier from the late 15th century; the extensive Frederick R. Koch Collection (individual manuscripts and letters of such composers as Berlioz, Brahms, Debussy, Elgar, Handel, Haydn, Mahler, Massenet, Mendelssohn, Mozart, Offenbach, Poulenc, Puccini, Ravel, Respighi, Saint Saëns, Schubert, Schumann, Sibelius, Richard Strauss, Stravinsky, Verdi, and Wagner, and very nearly the complete works of William Walton); and the James Marshall and Marie Louise Osborn Collection (which includes a set of important Mahler materials, such as a complete autograph manuscript of an early version of the First Symphony, as well as works by Henry Purcell, Alessandro Scarlatti, Ralph Vaughan Williams, and others).